gardening in the boroughs of nyc: Tomatoes, two kinds + one spicy pepper! 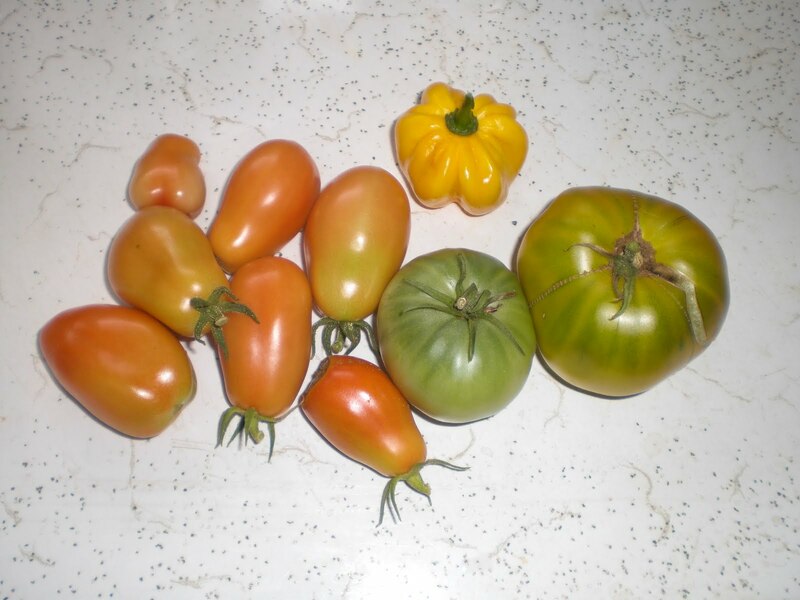 Romas are still coming in at a steady pace. We also got 2 more green heirloom tomatoes. I'm not sure what kind of heirloom these are, but they are really tasty! We also picked a colorful yellow habanero. This little fellow is sooooo spicy. I am so amazed by this plant, it keeps producing beautiful peppers! My little harvests make me laugh, because it's pretty sad and small compared to others around the blogosphere. Check out other Harvest Mondays over at Daphne's Dandelions. 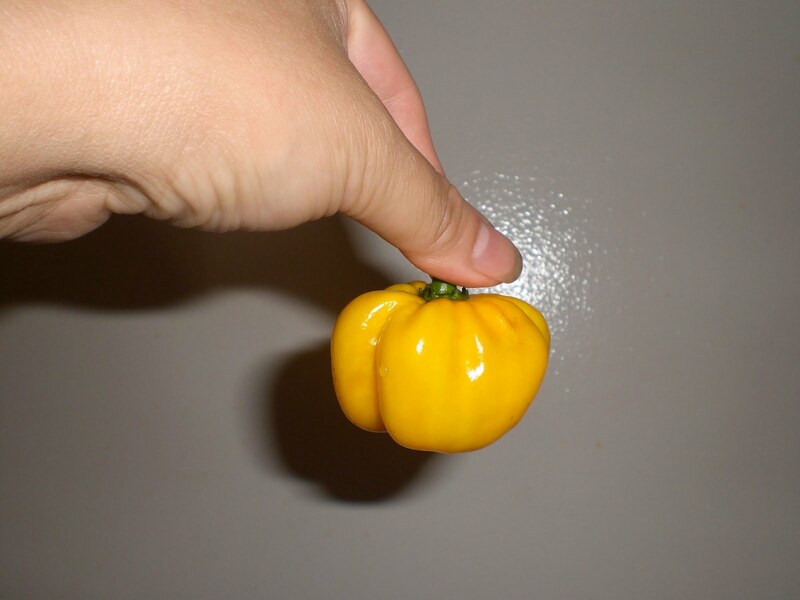 That is a beautiful yellow habanero! It looks so shiny and I just love that bright yellow color. Is it it's "final" color? I thought some of them turned orange, but I admit, my experience with habaneros is, um... zero. Your green heirloom tomatoes are very cool looking, too. I hope they were tasty! Yummy tomatoes! I'm still waiting on my Romas. I'm dying to make some sauce but they seem to be taking their sweet time! =0) Lucky you! That's funny, I received some habaneros from a friend and I hung them to dry, mostly because I didn't know what to do with them, but that was just procrastination LOL! Your pepper is simply adorable. You should be proud. It's not easy to grow something that cute. We're growing Aunt Ruby's German Green heirloom tomatoes that look very similar to yours. So, that could be your mystery tomato, and they are delicious! It's not quantity but quality and taste that counts! Good harvest of pepper (singular!) and tomatoes. I echo kitsapFG, we garden for taste and quality not quantity. The yellow habanero is so pretty and cute. "Harvest" is the word! Even a little is better than none! Some things I thought I planted a lot of haven't done very well. Never a dull moment with gardening, that's for sure. I'm grateful for whatever I'm able to pick now since last month zapped alot of my garden. That's a very interesting peppers. The hot ones have been some of my favorites this year. All of it looks good. Never had a habanero, would probably be too hot for us. Wow, you can actually eat your habaneros!? Too hot for me, I've been growing their mild cousins, Aji Dulce, Datil Sweet, Puerto Rico No Burn, etc. None of them have ripened yet this year though. Love those green heirloom tomatoes. And hey, a small harvest is better than no harvest. I've always been afraid to grow haberanos as then I'd have to process it. Your harvest is much bigger than mine which is nadda. :( I think the Habanero is too hot for me, but it sure is cute!